Hao Sun sees little difference between monitoring the health of buildings and bridges and monitoring the health of human bodies. 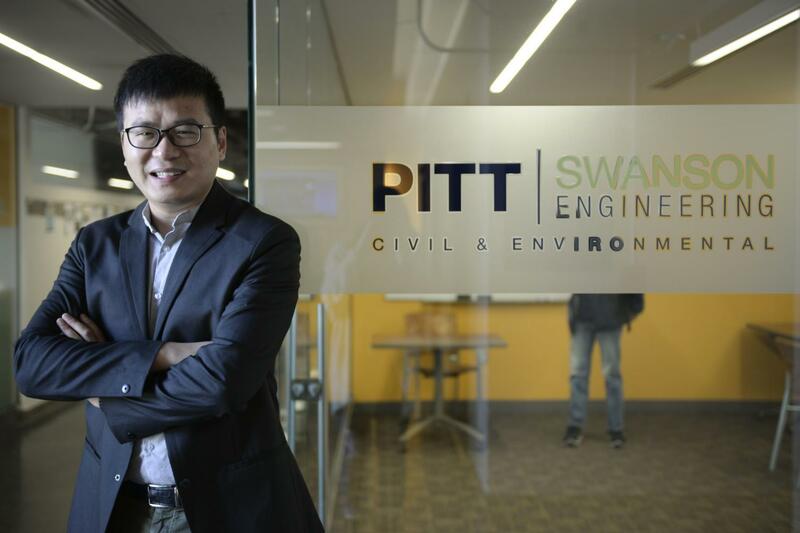 Hao Sun, an assistant professor in civil and environmental engineering at Pitt, has developed a method that can help detect structural problems in infrastructure after an extreme event like an earthquake or a hurricane. Performing this kind of research at 29 years old earned Sun a slot on Forbes’ 2018 “30 Under 30: Science” list. Forbes considers thousands of submissions and accepts less than four percent for each category. Experts in scientific fields, along with “30 Under 30” alumni, vote on the finalists. Jeen-Shang Lin, an associate professor in the bioengineering department and one of Sun’s colleagues, said he thinks Sun’s success at such a young age is due to his solid academic training and his extreme determination. Sun said he knew he wanted to pursue structural engineering during his undergraduate studies at Hohai University in China after noticing the mass of safety problems with buildings and bridges. He began developing a technique in 2010 while studying at Columbia that can find out if a structure has safety issues, and Forbes has since taken notice. He described the method for which he is being honored as having two major components. The first involves developing a wireless sensor system that will be built into buildings and bridges, while the second involves data analytics. With his expertise in complex algorithms, along with help from other collaborators in fields such as civil and environmental engineering and computer science, Sun said his proposed method will use big data — extremely large data sets that may be analyzed computationally to reveal patterns — trends and associations. Lin said Sun’s method is more advanced than previous attempts because Sun’s technology can measure the performance of a structure before, during and after an earthquake hits, whereas seismographs only record data when an earthquake hits. With these different sensors, Sun said this system can suggest if a building needs to be shut down, repaired or receive maintenance. The sensors can detect the environment’s changing climate — an idea he was inspired to come up with when he worked on a project sponsored by Quid, a platform for scientists, designers and engineers to tackle technical problems using cutting-edge algorithms and technology. Sun worked on a project monitoring the health of buildings in the Quad Cities — a region in Illinois and Iowa that experiences a lot of temperature change. “[The] sensor system can tell people how this effect propagates and whether after, let’s say 20 years, this building is safe or not,” Sun said, adding that structure in the area should see his sensors soon. Sun’s method has already been tested on a few real-world structures, such as the Cecil and Ida Green Building — an academic and research building at the Massachusetts Institute of Technology — and other buildings around MIT and Cambridge, Massachusetts. He said his team is currently monitoring the health conditions of these buildings and are awaiting results. Radisav Vidic, a professor and the department chair for civil and environmental engineering, has known Sun since he interviewed for his teaching position at Pitt. He described Sun as an exciting presence in the engineering department. On the subject of structural engineering, Vidic said he thinks the people building infrastructure are more focused on the design aspect of the structure than with safety — a problem Sun’s research can help fix. Both Vidic and Lin agree Sun’s research reflects well on the engineering department at Pitt and has the potential to make a global impact. Looking to the future, Sun said he hopes infrastructure will become technologically advanced enough that people will no longer have to be concerned about their safety after a natural disaster. In this vision, Sun said he hopes his research can be used to study buildings on campus.